Google's new Nexus specs revealed for real? 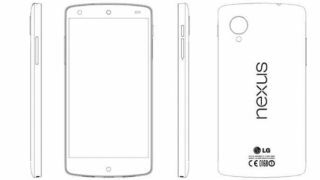 The specs for the rumoured LG Google Nexus 5 smartphone have been the subject of intense speculation for almost a year now, but there finally may be a little light at the end of the tunnel. A purported 281-page internal service manual has been posted online and showcases a series of drawings of the phone's design as well as a full spec sheet. According to the document, the device will pack a 4.95-inch Full HD 1080p display, a Snapdragon 800 quad-core processor at 2.3GHz, an 8-megapixel rear camera and a 1.3-megapixel front-facing camera. The manual also mentions 2GB of RAM, 32GB storage, a 2300mAh battery, wireless charging capabilities and NFC connectivity. The Nexus 5 is expected to arrive in November, around the same time as the Nexus 4 last year, and rock up running the forthcoming Android KitKat 4.4 operating system. It is expected to take many of its design cues from the recently-released LG G2 handset, which came close to usurping the HTC One as TechRadar's number one smartphone on the planet in comparison tests. The document, which could always be an elaborate hoax so don't take it as gospel just yet, can be viewed online here. Is that not enough for you? Here's everything we think we know about the LG Google Nexus 5, so far.